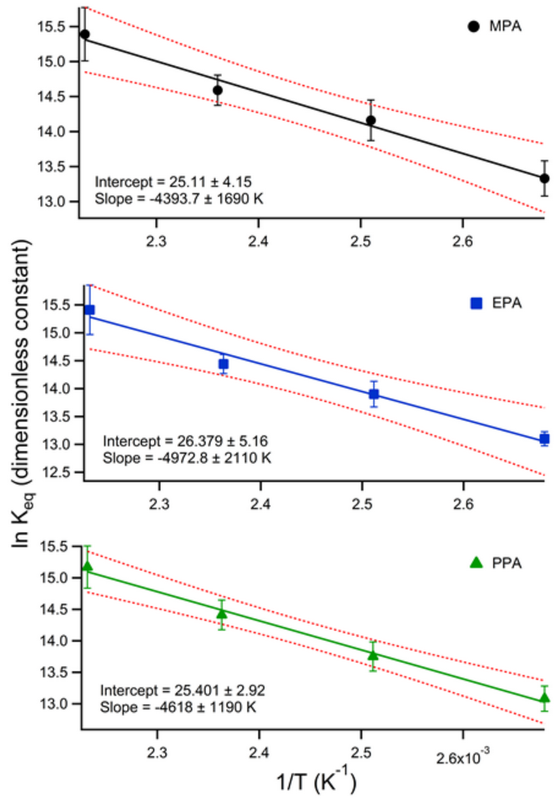 Previously, we reported an approach to quantify the energetics of association between neutral drift gas modifiers and two common chemical warfare agent degradation species by a combination of experimental drift time shift data as well as computational modeling in collaboration with Chris Hogan at the University of Minnesota. As a continuation of this research in conjunction with Dr. Hogan, we are pleased to report the acceptance of our article for publication in The Journal of Physical Chemistry A entitled, “Deducing Proton-Bound Heterodimer Association Energies from Shifts in Ion Mobility Arrival Time Distributions.” This report describes the Gibbs free energy, enthalpy, and entropy changes as propanol is dimerized with a homologous series of alkylphosphonic acids (methyl-, ethyl-, and propylphosphonic acids) and its conformation with the Kelvin-Thomson-Raoult model. 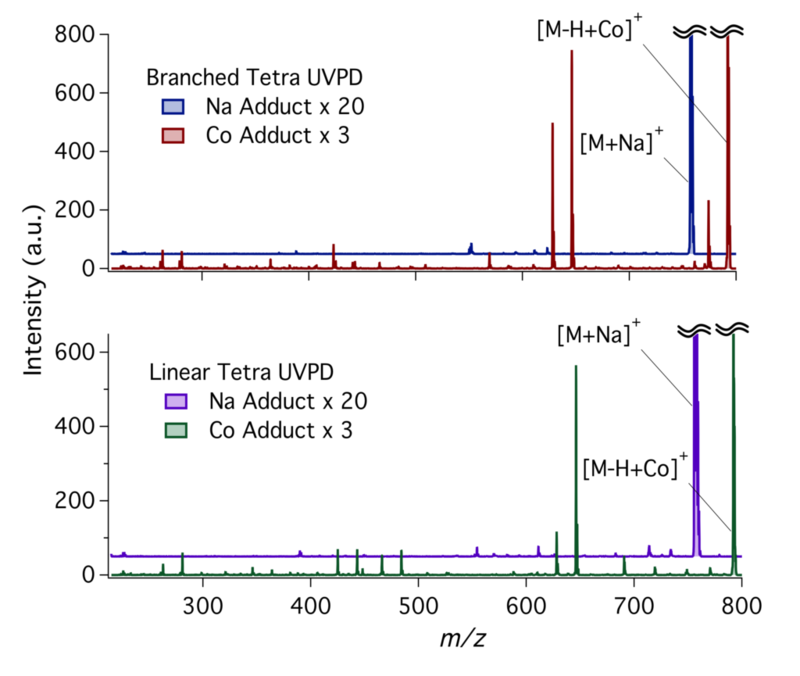 Following our initial experiments using ion trap mass spectrometry and atmospheric flow tube sampling (AFT-MS) for alkylphosphonic acid detection, we have applied a similar approach to the quantitation of tributyl phosphate in solution by analysis of headspace vapor. 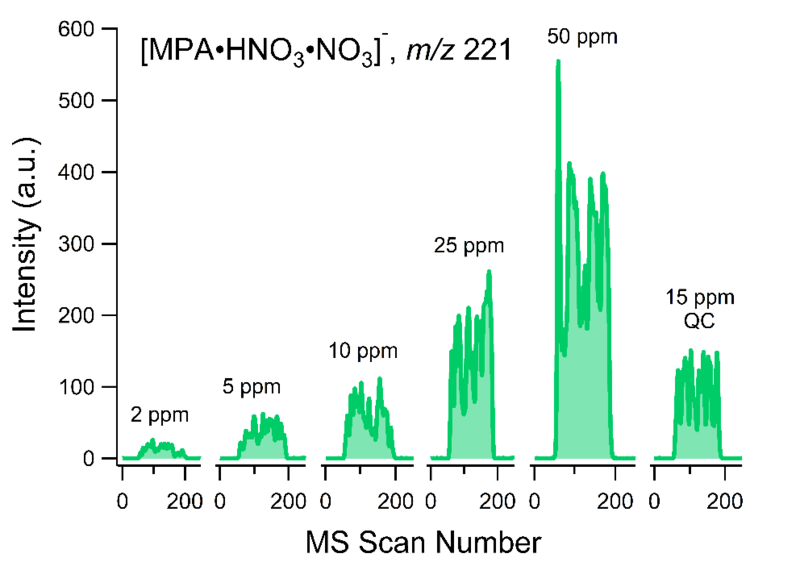 We are pleased to present this research, performed in collaboration with Robert Ewing from Pacific Northwest National Laboratory, as an accepted publication in Talanta entitled, “Ambient Vapor Sampling and Selective Cluster Formation for the Trace Detection of Tributyl Phosphate via Atmospheric Flow Tube Mass Spectrometry.” In this article, AFT-MS is shown to successfully quantitate tributyl phosphate down to tens of ppb in solution. Furthermore, analytical selectivity and quality control accuracy was enhanced by the introduction of specific dopant molecules. Continuing along our previous work to characterize certain cationized glycans with a variety of metals and with cobalt to enhance UV photon absorption, we are pleased to show our effort to demonstrate the formation of heterodimeric cobalt-glycan adducts in published form. 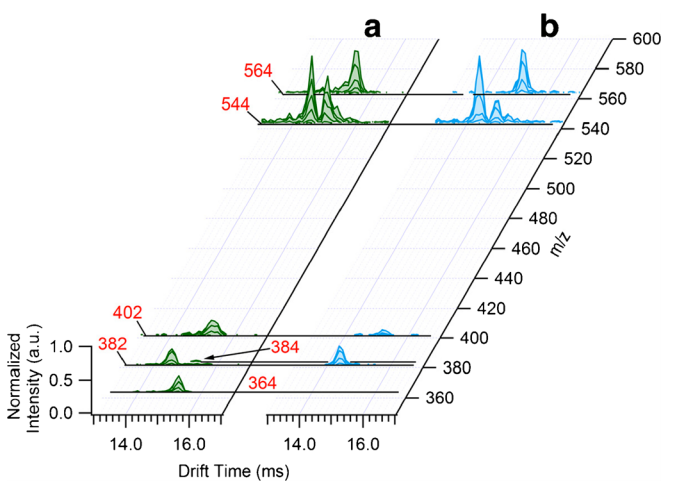 Now appearing as an online-first article in Journal of the American Society for Mass Spectrometry, our paper “Assessment of Dimeric Metal-Glycan Adducts via Isotopic Labeling and Ion Mobility-Mass Spectrometry” presents how important ion mobility separations are for tandem MS experiments performed on divalent metal-glycan adducts. Without the ability to use drift times to distinguish which precursor produced which fragment ions, component fragments from a heterodimeric adduct of two isomers cannot be deconvoluted. 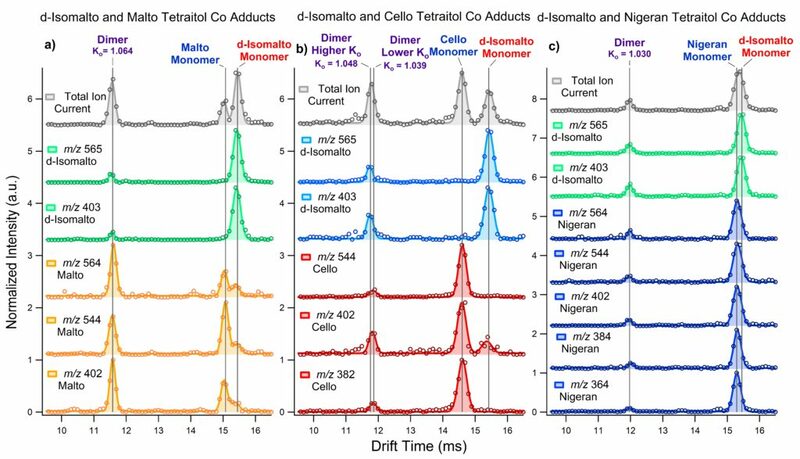 Specifically, the potential for isomers to form doubly-charged heterodimers–that are then dissociated into component fragments–will essentially create a scenario where chimeric fragmentation spectra are produced.